With the TI � in Las Vegas going after mature clients they completely revamped their family first pirate image, to one that is modern. This included the bedding and the first major change was the Trillium � Gel pillow by National Sleep Products �/Restful Nights �. 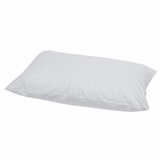 The Trillium � Gel pillow is also known as one of the softest synthetic pillows on the market today. National Sleep Products �/Restful Nights � are known for making a wide range of synthetic pillows but they created a new blown gel polyester fiber for Trillium which makes the Trillium � Gel pillow so soft. This process gives the pillow the loft and feel of a down pillow without any worry about the allergens that permeate feather/down products, this appeals to the TI clientele because they do not worry about any type of allergic reactions when customers experience their bedding. Another positive of the Trillium � Gel Pillow that is featured at the TI Las Vegas is the lifespan of the pillow. Where most down/feather breaks down after 3 years, the trillium polyester gel has a lifespan nearly 3 times that, 8-10 years. So you can trust that the pillow you experience tonight will be the same tomorrow and the night after for years to come. Purchase the best down alternative pillow on the market today with the Trillium � Gel pillow featured at the TI, Treasure Island � Las Vegas tonight and feel the soft difference that blown gel fiber makes tonight! The TI, Treasure Island � trademark is the property of New Frontier Hotel and Casino �; this trademark is not owned or licensed by HotelPillow.com. Ti, Treasure Island � trademark is used on this website for descriptive purposes to inform customers of HotelPillow.com that the Trillium Gel Pillow sold by HotelPillow.com is the same pillow found at the Ti Treasure Island � property. The Trillium Gel Pillow is not manufactured by New Frontier Hotel and Casino �.